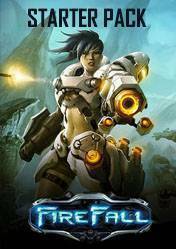 Firefall is a shooter MMO based on free2play model, which offers a unique experience. With a changing world, a deep narrative, a huge variety for customize our characters, and rewarding player progression, Firefall is a real multiplayer experience and with a solid PVE and PVP mode. The world in which is set is very large, which we can explore at will and constantly changing. The action is focuses on the use of skills, being able to switch between first person view and third. An elaborate system of loot, craft and progression, will delight any lover of the MMO genre. This Starter Pack includes: 30 VIP Days, 100 Red Beans, a painting exclusively war, the title \"Champion of Humanity\", the soundtrack of the game and advance access. There are no comments yet about Firefall Digital Starter Pack . You can be the first one!